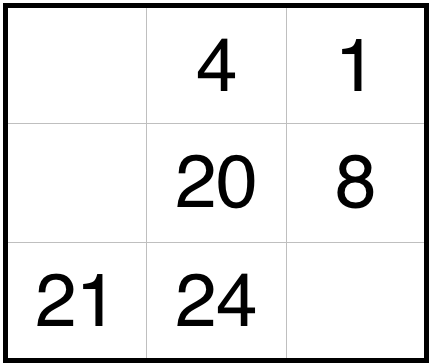 Which numbers should be filled on the blank spaces ? I only figure out that 4 + 20 = 24 and 1 + 20 = 21 then 8 + 20 = 28 I am not sure please help, thanks ! If we change the logic a and consider 24-4=20 and 21-1=20. By this way The first square will have 22 First square in second row will have 28 and 8 in last square And last square of last row will have 2. 32 in centre left (from left column). I really don't think there's enough information here to make it unambiguous what whoever created this puzzle has in mind; but that's my best guess. Not the answer you're looking for? Browse other questions tagged mathematics pattern algorithm algebra or ask your own question.